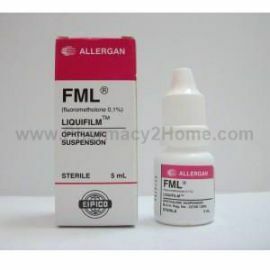 What is FML eye drops? An FML eye drop is a liquid ophthalmic preparation containing Fluorometholone as the active ingredient which is a synthetic steroid. It is used to treat eye inflammation flowing an allergy, injury or after surgery. Fluorometholone is a corticosteroid which helps in reducing inflammation. When instilled into the eyes it is absorbed by the inflamed cells in the eye. The corticosteroid then inhibits the release of substances which cause inflammation like prostaglandins and leukotrienes thereby reducing inflammation in the eye. Keep it capped. Do not contaminate the dropper. Store upright. Store below 250C. Do not freeze. How to take FML eye drops? Shake the bottle before use. Tilt you head back and instil one drop in each eye. Do not wear contacts while applying. Instil one drop in the affected eye 2-4 times a day. Administer as prescribed by your doctor. Wash your eye with plenty of water and consult your doctor. Skip the missed dose if it is time for next dose. If not, then take it as soon as you remember. Do not use if you are allergic to the medicine. Do not instil if you have an eye infection. When FML eye drops should not be used? Do not use in children below 2 years. Do not use if you have an eye infection or are allergic to the medicine. How long should you take FML eye drops?